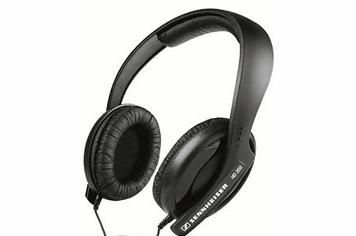 Sennheiser HD 202 review | What Hi-Fi? Exciting as it is to test and play with high-tech, high-end hi-fi, there's something rather thrilling about discovering a real budget belter of a product, which is exactly what we've got here in the form of the Sennheiser HD 202s. At just £26 (and we've seen them for even less) they cost less than even the most frugal of Friday nights on the town, yet they'll last a heck of a lot longer than even the most apocalyptic of hangovers. What you get here is a pair of over-ear headphones of the closed-back, commuter-friendly kind. They don't look particularly special, but they certainly don't look cheap, either, and the firm but comfortable fit means they shouldn't fly off your head unless you have to break into a serious sprint for the tube. What's really impressive, though, is the way the HD 202s sound. Naturally the audio's a little more enclosed than that from an open-backed pair, but by the standards of the closed-back class these are pleasantly spacious and airy, yet they combine that with lovely vocal focus and instrument clarity. They're fun, too, crisply attacking the bubbly bounce of Vampire Weekend's A-Punk, and there's confident tonal balance and control throughout. It would be wrong to get carried away, of course: there's only so much a pair of headphones at this price can do, and spending more will buy you better, but for this money our only complaint is a little softness in the otherwise impressively deep bass. The only other thing to note is that Sennheiser sees the HD 202s as a pair of headphones for inside the house as well as outside, so (as well as including a 6.3mm adapter) has used a 3m cable, which is rather awkward when on the go. There's a ‘winder' in the box with a belt-clip that neatens things up somewhat, but don't expect anything high-tech. We'll happily deal with that, though, because we're otherwise rather hard-pressed to think of a better way to spend £26.